Rayon Vert IS Green Flash. Check the translation. Green Flash, a relatively small brewery located in San Diego, California, began producing in 2004, taking traditional beer styles and putting their own unique twist to them. Ran by CEO Mike Hinkley and his wife, Lisa (who is the Vice President), Green Flash have excellent distribution in the United States for a smaller brewery, so getting their beers shouldn’t be too much of a problem. 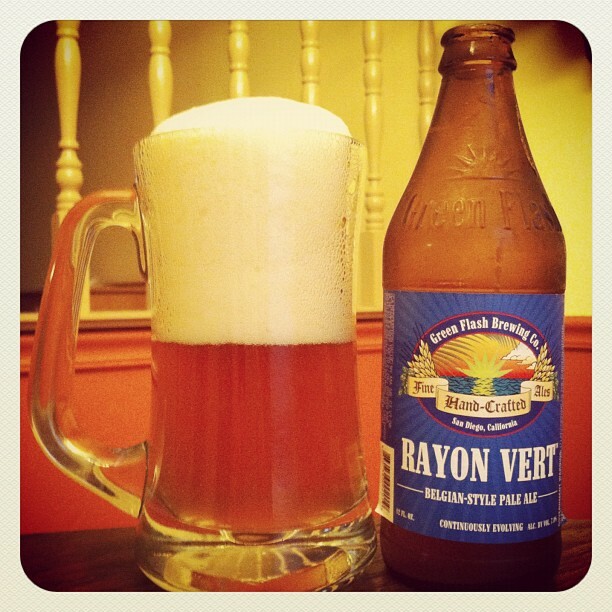 Rayon Vert is a Belgian-Style Pale Ale brewed for the summer months. This beer contains Brettanomyces, which is a wild yeast that is traditionally thought of as producing off flavors in beer. But in traditional Belgian ales, the flavors are highly regarded and encouraged. Rayon Vert is bottle conditioned, and Green Flash says it is “continuously evolving.” Stats on the beer: 7% ABV (alcohol by volume) and 32 IBUs (International Bitterness Units). Green Flash claims this to be the most complex beer they create — and when the brewery makes a statement like that, it excites me to try the brew. Knowing this to be a bottle conditioned beer, and judging by the sound this beer made when I removed the cap, I knew a gentle pour would be necessary. And despite the most gentlest of pours I could manage, this still produced a huge head, rocky and creamy in texture, billowing over top of the glass. Not going to lie: it was impressive; something to sit back from afar and stare at. 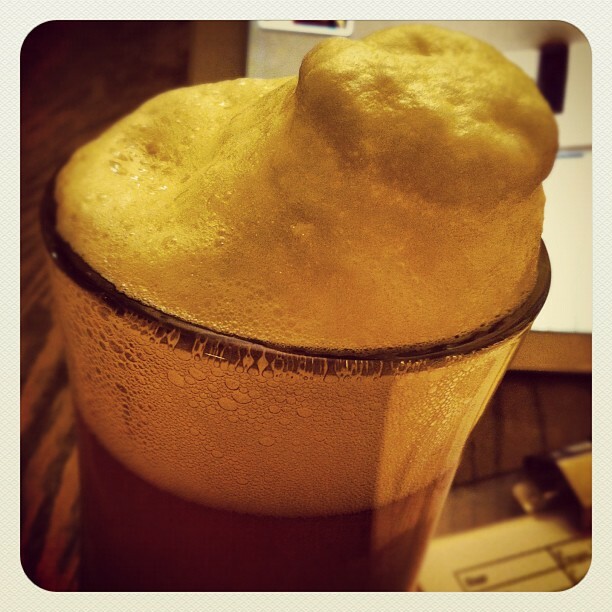 This brew looked like an ice cream float, with the head bobbing atop a golden liquid that was cloudy in body. And after I poured the yeast hugging the bottom of the bottle into the glass, it got even cloudier, with a light sediment present throughout. 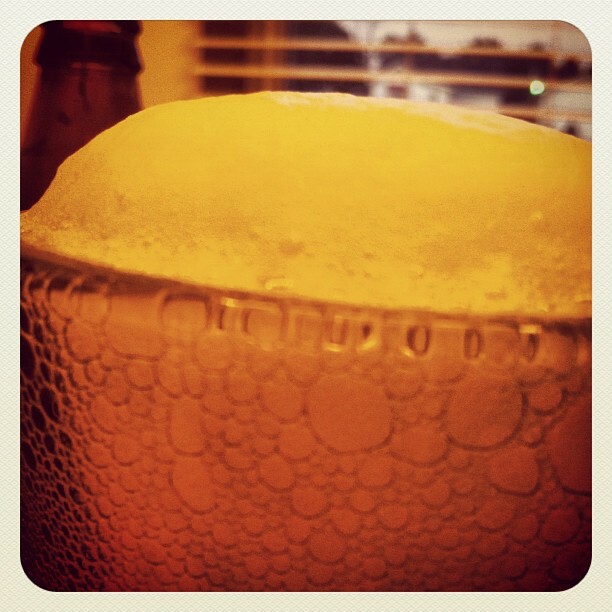 Needless to say, the lacing was a-mazing, leaving behind some of the largest chunks of suds I’ve ever seen. Rayon Vert is a looker! On the nose, this beer is delightfully complex. There’s a nice display of restrained but pungent hops — citrus (orange and grapefruit) are the main scene, supported by a fruity aroma that is kind of like a perfume, and of course a subtle dose of that classic West Coast pine. Then the there’s the Brett yeast — funky and earthy, backed by malty grain and a hay-like touch. Couple in some miscellaneous things going on, like notes of sweet apricot and green apple, and the nose is rewarded with an endlessly fascinating beer. 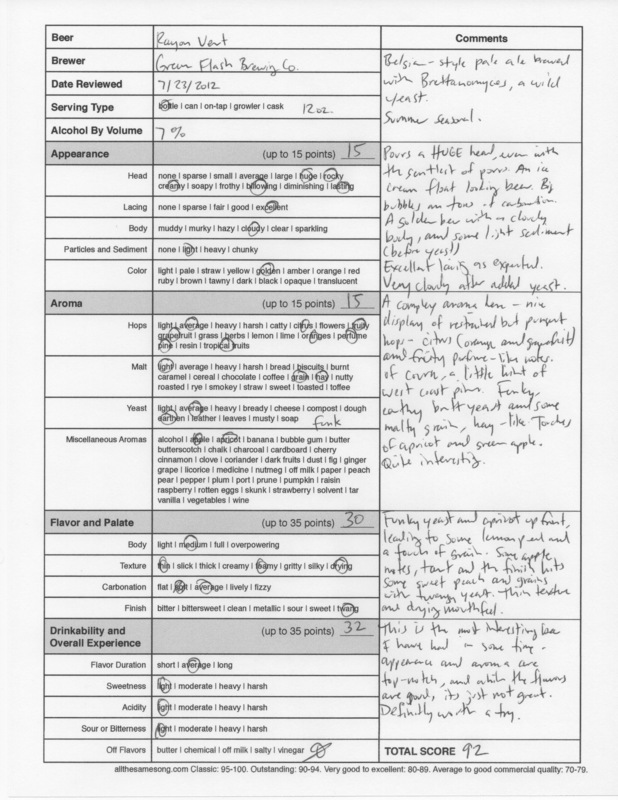 Does Rayon Vert keep up the excellence on the palate? There was funky yeast and apricot on the initial taste, followed by some lemon peel and a bit of grain. The middle of the taste features tart apple, leading to a finish of sweet peaches, grains, and that twangy yeast. The texture was thin with a drying mouthfeel. There just seemed to be something missing here — while the flavors were good, the beer seemed to be absent of that one particular taste that delivers a knockout punch. This is absolutely the most interesting beer I’ve drank in some time. The appearance and aroma are top-notch, and the taste is great, too; while it does seem to be missing that fuzzy “it” thing, it’s still a tasty beer and worth your time and money to give it a try. 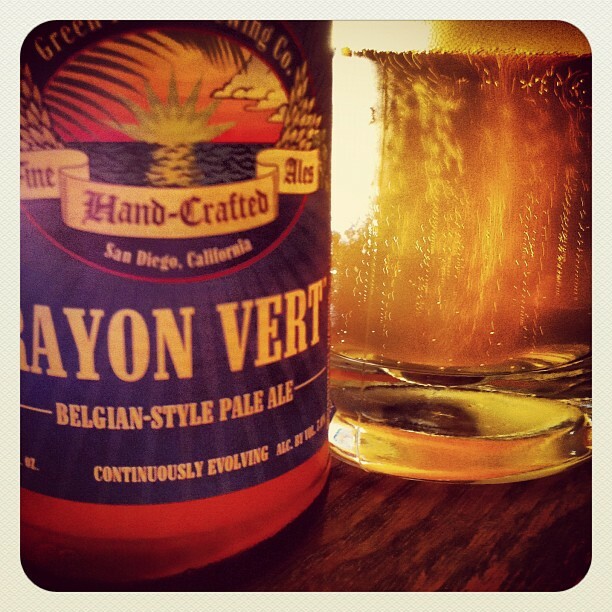 Green Flash Rayon Vert Belgian-Style Pale Ale, 92 points. Price: $2.99 for one twelve ounce bottle.